Everton were denied three precious Premier League points by incompetent officiating, with referee Mike Jones receiving no support from his assistants. With Everton dominating the first half they took the lead through a well worked goal from Leighton Baines. At this stage it was hard to comprehend what was to come as Everton looked likely to extend their advantage with every attack. Perhaps tellingly, Everton failed to score a second and the game went into half time still delicately poised. 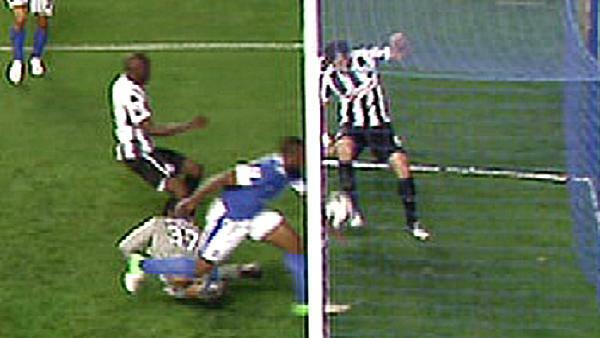 Within minutes of the re-start Newcastle were level, Demba Ba capitalizing on a mistake from Osman and firing past Howard in the Everton goal. The game was now alive, with both teams looking to win an enthralling encounter. Everton thought they had gone in front again, not once but twice. Firstly Fellaini was incorrectly adjudged to be offside after superb play from Miralles and Pienaar and then Anichebe headed home only for the linesman to rule that the ball had not crossed the line, despite evidence to the contrary. Despite these setbacks, Everton continued to push for a winner and when substitute Anichebe turned and finished expertly into the bottom corner on 88 minutes, Goodison went wild. Three points in the bag? Not on this occasion, poor defending and sloppy goalkeeping allowed Ba in again and the Newcastle centre forward celebrated his second equalizer of the night. A scintillating game of football, but Everton will be left seething by the poor performance of the referee’s assistant which denied The Blues three deserved points.